The apostles gathered around Jesus, and told him all that they had done. He said to them, “Come away to a deserted place all by yourselves and rest a while.” For many were coming and going, and they had no leisure even to eat. And they went away in the boat to a deserted place by themselves. A few months ago, a young woman, new to faith, reached out to me with a pressing need. After years living with an alcoholic boyfriend, she had decided to honor herself and leave the relationship. It was a step towards health every pastor prays for, and it raised a need every pastor dreads: finding emergency housing. As rejections mounted, our leadership team began to wonder what was “wrong” with our church family. Why were there not more offers to help? Did we need more sermons on Jesus’s call to compassion? After all, extra bedrooms are not rare; yet there was no room in our inn. A little digging revealed that we were really lacking was not space, but time—and lacking largely because of our perceived commitment to the gospel. It turned out we were a congregation filled with people trying so hard to be faithful. As good leaders, good employees, good spouses, parents, citizens, we were utterly spent. In laboring to “follow Jesus in everything,” we had filled our lives with endless doing. The resulting exhaustion meant “one more thing” was almost out of the question. 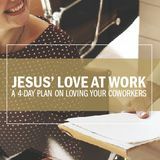 It was then we realized how much we need to return to actually following Jesus—the Jesus who had the discipline to rest, not because the work is done, but because rest is the only way work gets done. It is an essential truth we struggle to recognize: holy work requires holy rest. Without rest—of both body and soul—we quickly deplete. It is why God does not merely suggest a Sabbath, but requires it! At least one-seventh of each week should be devoted to rest (more if necessary). Not just to rest if we have time. Not just resting when everyone else rests. Not resting only when there is nothing more important to do. But rather, resting because there is Kingdom work to do! It is only by making time to rest that we find ourselves with the resources we truly need to obey our calling as the Body of Christ in a world of need. QUESTIONS FOR FURTHER REFLECTION: How is “resting” perceived by your family, friends, and colleagues? How does not filling 1/7th of your schedule sound to you? What one step could you take today to make rest more a part of your faithfulness to Christ? PRAYER: Creator God, who himself rested on the seventh day, help us remember that we are not greater than our Master. Give us grace to accept our human limitations, and grant us the courage to rest in a world that idolizes busyness. We offer ourselves to be your hands and feet in the world today; use us to your purposes, and may that be the only measure of our work. This we ask in Jesus’ name. Amen. Sabbath is more than a day off. It is a turning of the entire being toward God—a time set apart to contemplate life and work and praise the Creator for it all. The Christian observance of Sabbath is set apart by its lack of rules—there is no strict way to keep Sabbath in Christianity. It’s not a “must” of our faith. And yet, to ignore this fourth commandment is to miss some of God's richest blessings for his people. Join us for The High Calling series on Reclaiming Sabbath Keeping as we explore what the Christian Sabbath might look like and glimpse some benefits and challenges of Sabbath-keeping in today's productivity-driven culture. By Kirk Winslow. Published by The High Calling, May 18, 2014. Image by Cindee Snider Re. Used with Permission.